Zumba® Fitness in the Hamptons Long Island New York with European-American artist/fitness dancer Kinga presenting high-energy cardio, charismatic, calorie-burning dance fitness classes focusing on weight loss and body toning disguised as a dance party. Learn how to move your body feminine supreme with burning charisma. Are you ready to party yourself into shape? Whether you are looking to lose weight or just feel like participating in a high-energy party fitness workout, join European-American artist/fitness dancer KINGA in the never-ending journey of "getting-into" and "staying-in" shape by attending her charismatic, calorie-incinerating cardio-workout dance fitness classes focused on weight loss/body toning disguised as a dance party. 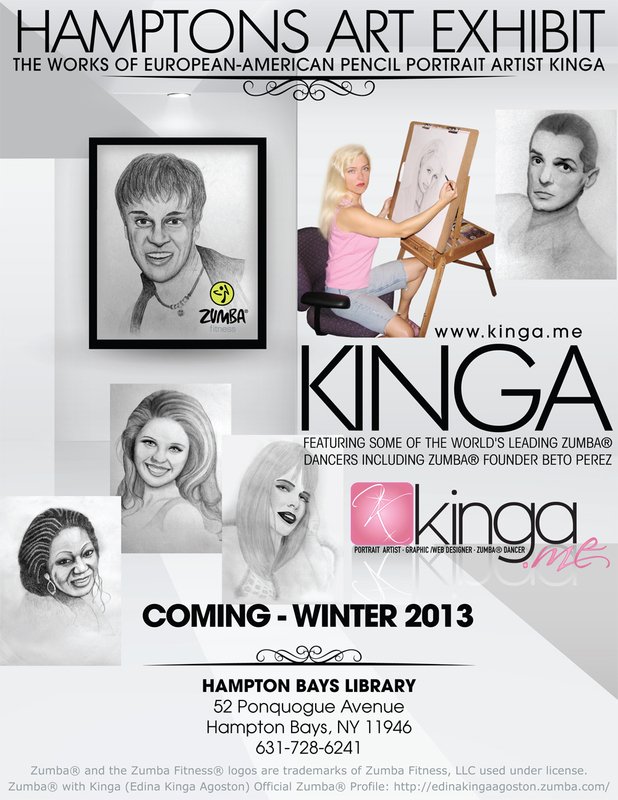 Kinga is available for Zumba(R) dance fitness master classes, gigs, parties and private/corporate special events and charity benefit fundraisers in the Hamptons, Long Island, New York. 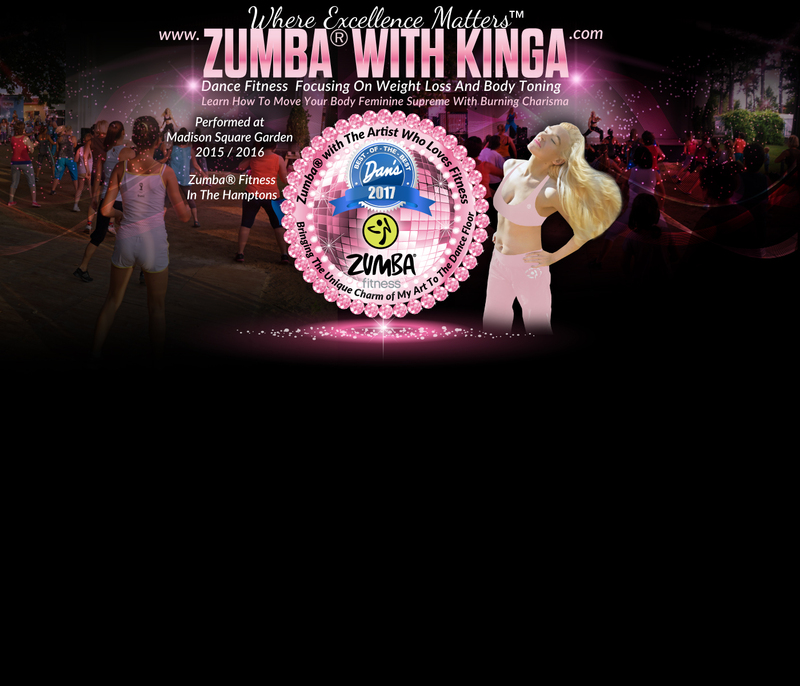 Zumba® with Kinga offers European-style dance fitness gigs for special events, charity benefit fundraisers and private/corporate parties. Zumba® classes, Zumba® master classes, Zumba® special events, Zumba® gigs, Zumba® corporate/private parties, Zumba® charity benefit fundraisers with European-American artist/Zumba® dancer, licensed Zumba® instructor, Edina Kinga Agoston for Long Island not-for-profit organizations, animal shelters, children's foundations, research institutions, health wellness events in Nassau County, Suffolk County and the Hamptons Long Island, New York. 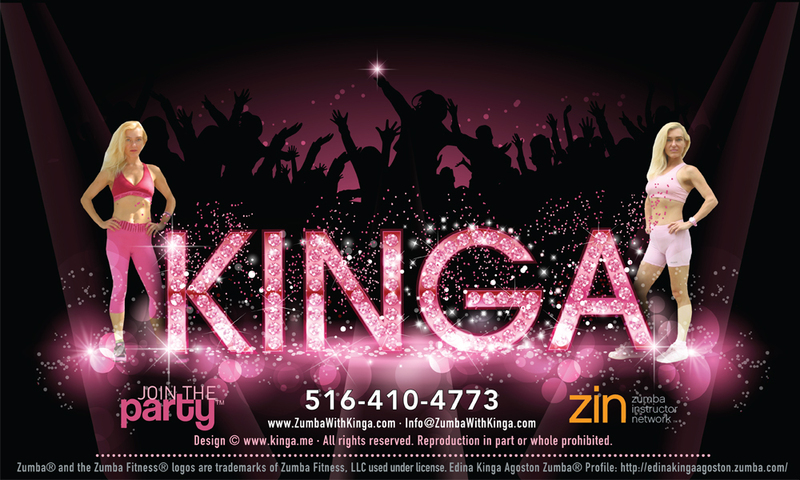 Zumba® with Kinga is available for anniversaries anniversary parties, baby showers, bachelor bachelorette parties, back on the prowl parties, bar bat mitzvahs, birthday parties, black tie events, bridal showers, celebrations, charity benefit fundraisers, children's kids parties, cocktail parties, communions, christenings, corporate meetings gatherings events, divorce newly single parties, engagement parties, girls night out, graduation parties, high school proms, Holiday parties celebrations (Valentine's Day, St. Patrick's Day, Easter, Memorial Day, Fourth 4th of July, Independence Day, Labor Day, Halloween, Thanksgiving, Christmas, Hanukkah, Kwanzaa), ladies night out, luncheons, office parties, pet parties, private parties, retirement parties, receptions, retreats getaways, seminars lectures, special moments, special events, sweet sixteen 16, weddings wedding showers, Zumba® dance fitness for teachers after school. Zumba® with Kinga in the Hamptons Long Island New York is available for Zumba® dance fitness classes, Zumba® master classes, Zumba® gigs, Zumba® special events, Zumba® charity benefit fundraiserws, Zumba® private/corporate parties in the hamlets and villages in the town of Southampton including Westhampton Beach, West Hampton Dunes, Westhampton, Quogue, Quiogue, East Quogue, Riverside, Flanders, Hampton Bays, Shinnecock Hills, North Sea, Southampton, Water Mill, Bridgehampton, Sagaponack, Sag Harbor as well as in the hamlets and villages in the town of East Hampton including Sag Harbor, Wainscott, East Hampton, Northwest Harbor, Springs, Amagansett, Montauk.